There's just something about spending time outdoors on a beautiful day, feeling the sunshine on your skin, and a light breeze blowing your hair. Whether you like to drink your morning coffee on the patio, have dinner with your family, or lounge in a chair and read a book, patio design is all about comfort and enjoyment. Make note of the following six patio must-haves for the ultimate in patio design. Just imagine coming home from a hard day at work or from a tough workout and sinking down into the warm, bubbly water of a Jacuzzi. Not only is a Jacuzzi perfect for solo relaxation, your friends will love coming over, catching up, and lounging in the Jacuzzi. 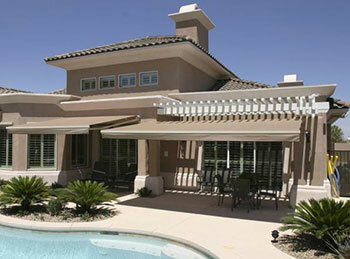 When it comes to patio design, you don't want to forget to install an awning. Not only do they add to the beauty of your space, they are perfect for blocking the sun on a sunny day, protecting your skin, and making the space a bit cooler. Options of retractable awnings allow you flexibility to retract it on cloudy days, or to lounge in the sun, if you so choose. A fire pit is perfect for those cooler evenings; creating warmth and an ambiance that makes you want to cozy up with a loved one. Make it a romantic evening and enjoy a glass of wine with your partner, or gather around the fire pit with your family and create wonderful memories making s'mores. In a past blog post, "Our Favorite Home Improvement DIY Projects," you'll learn how to make a fire pit yourself. Furniture that is water resistant and made specifically for the outdoors is a must. Constructed to last in outdoor conditions, you can find all types of designs, patterns, and colors, of water resistant furniture that not only looks great, but also is comfortable. With ZipRite Shades you can make your living space larger. These exterior shades will keep your pets inside and will protect you and your family from the elements. Completely sealed between the track and the shade, it's as if you've added an extra room to your house. A patio garden with beautiful blooming flowers can really brighten up any patio space and make it more inviting. Regardless of whether you go with a number of potted flowers or take the time to plant flowers along the edge of your patio, you'll love sitting amongst the vibrant, blooming flowers. For a free in-home estimate to update your patio design with ZipRite Shades or retractable awnings, contact Polar Shades at 877-260-6110. You'll be happy you did!